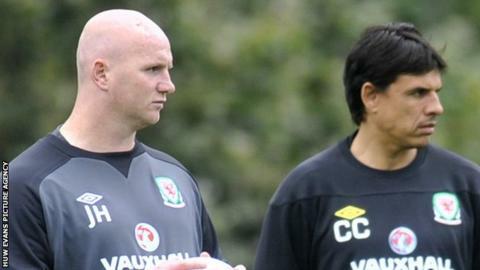 Former assistant manager John Hartson believes Chris Coleman will sign a new contract to remain as Wales boss. It is understood Coleman, linked with the vacancy at Crystal Palace, is likely to continue in his Wales role. And Hartson, who stepped down as Wales assistant manager last week, said: "I personally think he will sign an extension with the Welsh team." Coleman's future with Wales has been the subject of speculation following a disappointing World Cup campaign. His current contract with Wales expires after Saturday's friendly with Finland in Cardiff. The Football Association of Wales has been in ongoing talks with Coleman, who previously said he was undecided about whether he wanted to continue in the role. The 43-year-old has been linked with the managerial vacancy at former club Palace, who parted company with Ian Holloway in October. Former Arsenal and Wales striker Hartson will not be involved in the preparations for that game after stepping down as assistant manager. "I spoke to Chris and he wished me well and we had a little chat," Hartson added. "But he never discussed anything with Palace and he never discussed anything about his contract with Wales. "I'm led to believe that two or three months ago there was a contract there for Chris to sign. "We got beat to Macedonia away and got beaten by Serbia at home, and we weren't great on the night. "I believe then what happened was the FAW had a slight change of mind. "They decided then to withdraw that contract offer and have a look at the next two games and to judge it there. "We had two good results - we beat Macedonia at home and we went to Belgium and we got a fantastic draw." "Now I believe [the contract] is back on the table for Chris." Hartson was a member of Coleman's staff during the 2014 World Cup qualifying campaign, but decided to step down because of increased media commitments and family reasons. "I enjoyed the 12 months I was involved. I felt as if I've learnt a lot," Hartson added. "With no disrespect to Chris I didn't have a major role. I was in there to look, to listen and to learn and I didn't take an awful lot of sessions. "At times I found myself in my room on my own quite a lot and didn't feel I had that much of an input. Maybe if I had more of an input it might have been a different story. "I weighed it all up and thought to myself I'm far too busy working in the media and another child on the way. "And I'm very committed to my foundation, The John Hartson Trust, which raises money and awareness for great causes."